Eatwith organise cooking classes and dinner experiences with local hosts all over the world and they kindly organised for me and Cody to attend one in Barcelona. We were met by Patricia’s husband Philipe outside the Barcelona Casino which was just a short walk away from the harbour and we were welcomed onto the boat. Patricia had stayed behind on the boat to finalise the food that we would be enjoying later that evening and we were warmly greeted on our arrival. Dinner was to be served out the back of the boat on the foldaway table located just in front of the huge wheel used to steer the boat when at sail. The table was set for our arrival and we were soon toasting the evening with some delicious white wine. 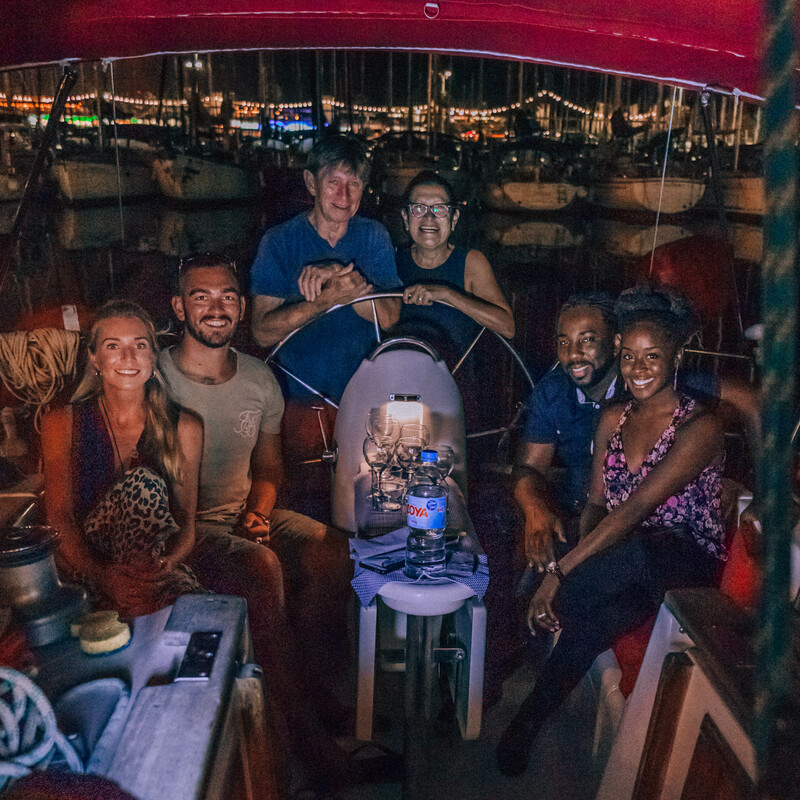 Patricia and Philipe actually live on their boat and often sail around the Mediterranean together so they explained that having guests for dinner in this way is, for them, almost the same as travelling; they get to meet lots of new people every time they host an evening and they’ve met many people who they are still in contact with. Philipe told us about the history of Barcelona and Catalonia while Patricia, who had previously been a chef and caterer, treated us to local Catalan dishes that were delicious. We also learnt lots about our fellow dinner guests, Marquitta and Kenneth, from speaking about our different jobs, homes, travels etc. We all even swapped Instagram accounts to stay in touch! It’s easy to imagine the amount of friends that Patricia and Philipe must make from hosting evenings like this. Patricia served up a delicious four course meal starting with Coca Catalana – Catalan bread, toasted, with tomato, oil and a terrine of bonito fish on a bed of rocket which was absolutely delicious. I’m a huge seafood lover (apart from octopus and oysters – just no!) so the seafood based menu was perfect for me. Next up was bonito fish tartar with fresh avocado and spring onion and some more bread. Patricia told us that there was a surprise in the middle of the tartar and asked us to guess what it was when we reached it. The surprise was crunchy and added a nice texture to the softness of the bonito fish and avocado, and Patricia revealed that this was in fact black rice which had been fried in oil which makes it behave like popcorn and it tasted delicious. Patricia explained that this was a technique used in Indian cuisine but she had incorporated it into her dish and it worked beautifully. Patricia had contacted us prior to our arrival to suggest this change to the listed menu on the Eat With website and it went down a treat. Our main course was a traditional Catalan dish called fideua: similar to paella but, instead of rice, short strands of pasta are used as the base to which Patricia had added prawns and calamari plus saffron and aioli. I love paella so it was wonderful to try something similar and specific to the Catalan region and it tasted delicious. The fideua is cooked in the same way as paella in a large pan and so is a great choice when entertaining a group as it’s easy to make enough for everyone and it’s delicious. By this point we were already feeling very satisfied both in terms of food and our company and the evening in general but Patricia had one last dish for us. She asked Philipe to set a timer on his phone to ensure they cooked for the perfect amount of time and after a few minutes we were served chocolate coulant with a red fruit coulis. The coolant is similar to lava cake, solid on the outside but with chocolate sauce in the middle which runs out as a liquid when the cake is cut into. This mixed with the berry coulis was a perfect combination and a perfect end to a wonderful evening. Once dinner was over, we spent some time chatting and took some photos before saying our goodbyes and heading home. Eatwith is a fantastic experience that I would recommend to anyone and everyone. It’s cheaper than a meal out in a restaurant and you’ll leave feeling not only full from the delicious food but also full of joy from such a wonderful evening which is a memory that you’ll never forget. If you want to book an evening with Eatwith, please CLICK HERE to visit the website. You can find Patricia and Philipe by searching their experience name “The Best of Catalan Gastronomy on a Sailing Boat” within the website.